This article is about the island parish of Orkney. For the islands of the same name, see Holm (island). For other uses, see Holm (disambiguation). Holm (pronounced /hæm/ ) is a parish on Mainland, Orkney. An adjacent Sound, running between Mainland, and Burray, is named after Holm. It has since been blocked up by the Churchill Barriers. The parish flanks the north side of the Sound and extends to within 2.5 miles (4.0 km) of Kirkwall, and contains the village of St Mary's Holm, as well as the island of Lamb Holm. The Mainland section is 6 miles (9.7 km) by 2 miles (3.2 km). The shores are mostly rocky, and the interior consists of light thin, loamy land. 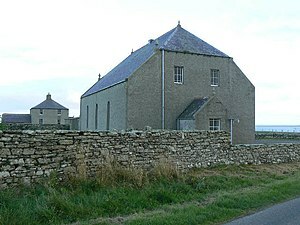 Holm church and manse are both of unusual design. The church has no spire or turret, and the manse is constructed so that all chimneys appear through the centre of a pyramidal roof. Netherbutton Radar Station, which was part of the Chain Home system, was situated on both sides of the A961 road, although little now remains except four concrete mast bases. Its construction was supervised by Leonard Chapman, who then held the rank of corporal. F. Marian McNeill, folklorist, suffragist and a founder of the Scottish National Party. Her father was Free Church minister of Holm for nearly fifty years, and her brother Duncan was also a writer. ^ The location is grid reference HY462043. See "Raf Netherbutton, Chain Home Radar Station" Archived 2011-07-19 at the Wayback Machine scotlandsplaces.gov.uk. Retrieved 29 November 2009. Wikimedia Commons has media related to Holm, Orkney Islands.